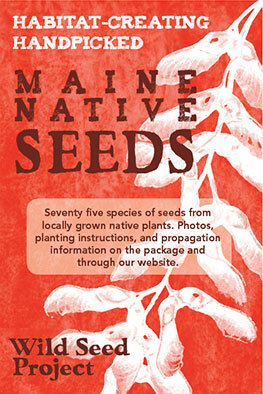 Our mission is to return native plants to the landscape. Wild Seed Project works to increase the use of native plants in all landscape settings in order to conserve biodiversity, encourage plant adaptation in the face of climate change, safeguard wildlife habitat, and create pollination and migration corridors for insects and birds. 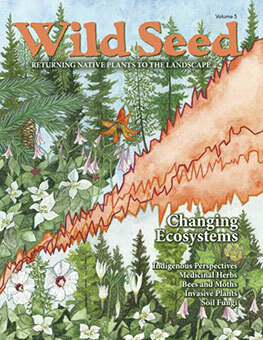 A 501(c)(3) non-profit organization founded in 2014, Wild Seed Project ethically collects and sells seeds of wild and uncultivated forms of native plants and educates the public through our interactive website, engaging events, and annual magazine, Wild Seed. 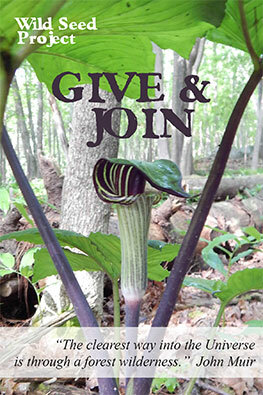 We share information and bring people together around native plant conservation and horticulture to engage citizens in promoting native plant populations and restoring biodiversity. Maine’s landscape, made of rocks and soil stretching from mountains to sea, with forests, meadows, wetlands, and human settlements, is biologically dynamic and important to many creatures. But it is the plants that are the foundation of the terrestrial food chain upon which all land-based creatures, including ourselves, ultimately depend. People are the biggest stressors to these plants, and we pose a new challenge with our expanding numbers. We pave over their habitats, we pollute their soils, and we favor exotics that are selected to appeal to human aesthetics and not to the needs of other life forms. Our native flora has survived climate change many times before—there have been numerous ice ages over the last 2 ½ million years. However, the combination of human-induced climate change, loss of habitat, and destructive land use practices that make species migration difficult has pushed wild organisms to the edge. Yet we all are dependent on a healthy ecosystem for our sustenance, and indigenous plants are the foundation of that ecosystem. We need to find a better way to exist alongside nature. The goal of Wild Seed Project is to build awareness of the importance of native plants and to give people the tools to restore biodiversity. When you plant a native seed, it grows into a tree or shrub or wildflower that provides habitat for all the other creatures up and down the food chain, from pollinating insects, to birds, amphibians, mammals, and invisible creatures of the soil. We aspire to restore native species to our landscapes so they can send their descendants into the future and become part of the new landscapes to come. Our hope is that our work will engage you – a resident or visitor, a scientist, an artist, a student, a backyard gardener or farmer, a neighborhood activist or city official – and help you both see the beauty and critical role of native plants, and take action to restore them.